The Chilluminati present an open air camping festival brought to life with consciousness, harmony, mind-expanding music, and visuals. We create these events as Cosmic Condensates; our Music, Dance, Light, and Love form a sacred structure in Space and Time… a microcosmic celebration of the Infinite. We invite all to come dance, relax, and explore under the sun, moon, and stars. Three days and two nights of psychedelic music, art, performance, workshops, and community. The cost for the event is $40 in advance and $50 at the gate. WE PROVIDE: 2 stages of sound and light, 3 days of camping in a beautiful natural environment (rain or shine), running water, bathrooms and hot showers, full vending (including alcohol for those 21+). YOU PROVIDE : a tent, enough food and beverages for the weekend (or some cash – food and beverages will be available for sale), NO GLASS, NO DRUGS, NO PETS, NO FIREWOOD (firewood can be purchased on-site). Please respect the venue by keeping the grounds free of litter. **This is a LEAVE NO TRACE EVENT** (yes, this includes beverage containers and cigarette butts!) Become part of the community. Help the planet, and help us. Pick up after yourself. Leave the site, and our reputation as a community, better than you found it. This is the first of two weekend-long camping festivals the Chilluminati will be creating in 2010. 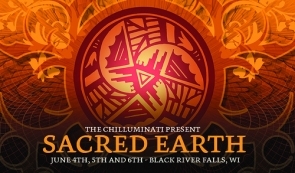 Sacred Earth, Open Air will be in western Wisconsin, close to the heart of the psychedelic tribes of that state and those of Iowa, Minnesota, Ontario, and Illinois. Chill/Downtempo/Ambient, is the air we breathe Fire – Deco in three Dimensions: Art, Light, Projection. As well as Fire and Kinetic performances. // Full Psytrance and Psychedelic Chillout stage lineups TBA. // Growth workshops; commune with your fellow psy-goers and learn something in the process! June 4, 5, 6 RAIN or SHINE (enclosed pavilion keeps us dry if it rains) ; gate opens at NOON on Friday (no registrations can be accepted before that time).